Peter Hook announced this week that he’ll release a digital live album capturing his performance of New Order’s first two albums — 1981′s Movement and 1983′s Power, Corruptions & Lies — with his band The Light in Manchester earlier this year, then took the opportunity today to swipe at his ex-bandmates’ performance on “Jimmy Kimmel Live!” last night. 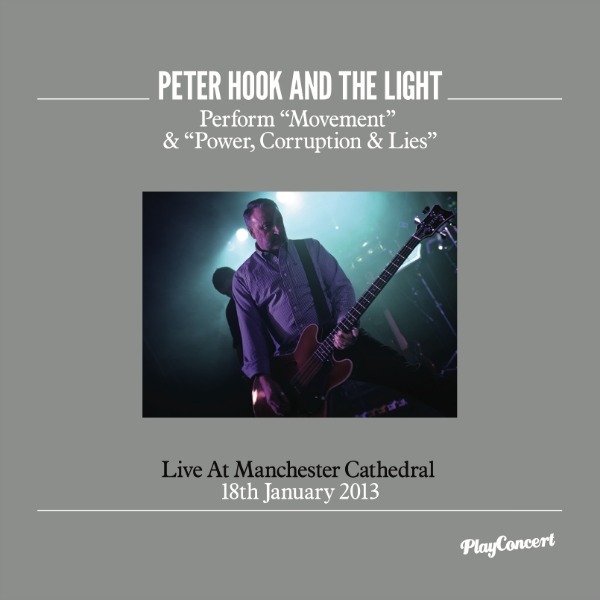 The digital album Live at Manchester Cathedral will be released next Monday by Play Concert, and features Peter Hook & The Light’s full performance of the two New Order albums plus other singles and B-sides from the 1981-83 period. Hook performed the records in London and Manchester in January, and plans to bring his New Order show to the U.S. this fall, according to his management. Just seen ‘New Order’ on Kimmel.. Beam me up Scotty… Power, Corruption & Enterprise. Hook… I used to like you but your ego gets in the way of everything. Everything. I don’t get it. And I’m a Trekker. I assume he’s referring to Bernard’s more rotund, Kirk-esque figure. The only difference betweeen Barney and Hooky is that Hooky does not wear tight t-shirts. Haven’t seen Hook in performance but that video from Kimmel is admittedly a bit silly, with the lame and dancing, generic background video, advertising his own band(!) on his shirt and all. I’m not saying Hook isn’t jealous but in this particular video there’s nothing to be jealous of, and lots to mock. I would say that’s the pot calling the kettle black- if it wasn’t for the fact that New Order has reformed and is a band again- just not with him in it. New Order hasn’t been touring and making money off of Joy Division’s legacy either like he has, using it as a cash cow. Figured it was just a matter of time before he started doing that to New Order’s music also and here we are. Hooky has and always will be king of all douches. Hooky has become a whinly little b!+ch. Its too bad they cant get along and cash in together cuz he really is a great bass player. Hook singing the “Movement” songs makes sense to me, since his voice is sort of Curtis-esque and NO still sounded like Joy Division at that point. I’m really interested in hearing the “Power” half of the set, though. It could either put a really cool spin on things, or hideous. I’ll reserve judgment for now. Peter Hook is a great bass player,I wish that they would be able to put this crap to bed and get back together. But it also seems to me that New Order is a happier band without him in it. It’s maybe kind of telling that Revenge, Monaco, and Freebass all put out only one or two albums before calling it quits. This is like the Pink Floyd split in a way-Waters went around with his band performing Pink Floyd songs while Pink Floyd toured without Waters. He is such a maroon. A friend of mine caught one his shows on the East Coast and said it was heavily attended by 10 people. We’ll see what happens when he’s reached the end of his rope. He is pathetic, just go create something new or rejoin the band. New Order is milking their own legacy without any new material as is Peter Hook & The Light. As being a long time fan this has grown tiresome. I would say that they are not exactly proficient at releasing new material but they did just release new stuff (albeit material written around 2005)this year. Been to two New Order gigs last year in Melbourne, Australia. One was a stand alone gig and excellent.The 2nd was at a festival and pretty sh!t as have most of their festival performances since ‘reforming’. Their performance on Kimmel was better than their festival performances however the sound misses Hooky. I also saw Hooky do Closer etc live and that was special,having never seen JD, however he can’t sing.His singing on the Movement and PCL tour is ‘William Shatnerish’ at best.God awful.New Order and Hooky will only bury the hatchet in each others heads.Sad loss.Thank heaven for youtube. Hook’s band sounds good. The Kimmel performance was pathetic. It just felt sad, and I’m a huge NO fan. Bernard’s singing has somehow gotten worse, didn’t think it was possible. To be honest Hooky’s sounds much better! I’m a big fan of the Peter Hook and the Light stuff. Hooky has put together a great live band, and why begrudge him the right to play classic albums that are obviously important to his legacy? I just wish the new stuff was being released on vinyl; I have the Unknown Pleasures in Australia 2xLP and its sounds excellent.